During the Kosovo War of 1999, the Serbian police carried out an operation in the Qerim neighbourhood of Gjakova. Witnesses subsequently testified on the events at The Hague Tribunal. The following text, providing the findings of the court, is taken from the trial of Vlastimir Đorđević who was head of Serbian security forces (MUP) at the time. 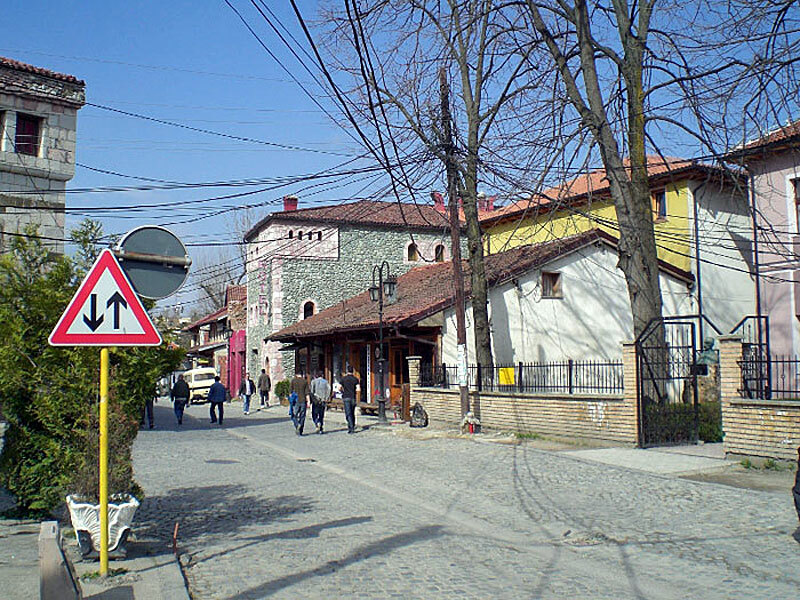 Street view of Gjakova (Photo: Robert Elsie, 2 April 2009). 1. An operation by the Serbian police took place on Miloš Gilić/Millosh Giliq Street in the Ćerim/Qerim neighbourhood of Đakovica/Gjakova on 1-2 April 1999, located in the north-eastern part of the city, in the vicinity of the bus station, to the right of the road leading to Deçan/Decane and north of the road leading to Klina/Kline. On 1 April, Novak Pitolić, the chief of the Đakovica/Gjakova police went to every Albanian house in the Ćerim/Qerim district and told the occupants not to leave the houses and that they were safe. 2. At approximately 2200 hours on 1 April 1999, large spotlights were cast on the Albanian houses in Đakovica/Gjakova. Just over two hours later, on 2 April 1999 between 0005-0025 hours, Serbian police started knocking on the doors of the houses in Miloš Gilić/Millosh Giliq Street, and then torching the houses.Attacks began close to K74’s house, located at 76 Miloš Gilić/Millosh Giliq Street. K74 was, at that time, in the basement of the house of his neighbour, Gezim Nagafci. He later went to his courtyard where he stayed until 0600. He heard and saw the Serbian forces shooting at the locks on the gates of houses, including the lock to Lulzim Vejsa’s house. He also heard noises of vehicles, which he interpreted as the sound of vehicles breaking through the gates of houses to gain entry into the courtyards. 3. That same night, members of five Kosovo Albanian families (Caka family, Hoxha family, Vejsa family, Haxhiavdija family and Nuci family) had gathered for protection in the basement of Lulzim Vejsa’s pool hall located at 157 Miloš Gilić/Millosh Giliq Street. In the preceding days Serbian police from the neighbourhood, in uniform, regularly stood about and drank in front of Lulzim Vejsa’s pool hall. The pool hall and the house of Lulzim Vejsa were in the same compound. Only a few steps separated them. Since 28 March 1999, Dren Caka (10 years old at the time of the events) and his family, consisting of his grandfather, Xhemil Caka, his grandmother Nakije Caka, his uncle Nehat Caka, his father Ali Caka, his mother Valbona Caka and his three sisters Dalina, Delvina and Diona, who were 14, six and two years old, respectively, at the time of the events, had been sheltering in the basement of the pool hall, which was only two houses from their home. 4. In the night of 1 April 1999, the entrance to the compound at 157 Miloš Gilić/Millosh Giliq Street had been blocked by a car parked in front of the gate. At about 0015 hours on 2 April 1999, Hani Hoxha saw that the gate to the compound was moving. A vehicle was being driven against it in an apparent effort to break through. Then Serbian police knocked on the door. In total, some 24 or 25 Kosovo Albanian people had taken refuge at the pool hall, 21 of whom were in the basement (comprising women and children and one 50 year old man with a mental impairment), while three men Lulzim Vejsa, Behar Haxhiavdija (Lulzim Vejsa’s brother-in-law) and Hani Hoxha were outside by the pool hall, keeping guard. Lulzim Vejsa heard police shouting for them. Previously it had been decided that should anything happen, the men would leave while the women and children would stay. It was thought that only the men were at risk. Having heard the shouts of the Serbian forces, Lulzim Vejsa and Behar Haxhiavdija left the house from a small window located behind the building. Hani Hoxha told the other two that he wanted to see if anyone entered the courtyard and that he would join them in a few minutes. Behar and Lulzim jumped the wall that divided their courtyard from their neighbours. After waiting for Hani for a time, they started to pass from one courtyard to the next, waiting a couple of minutes for him in each, but Hani did not join them. About 30-45 minutes later, they saw that Lulzim Vejsa’s house was in flames. 5. Hani Hoxha stayed for some minutes but left once the attackers had broken into the courtyard. Eight to 10 men broke into the compound. Hoxha saw that some of the men wore regular police uniforms while some wore camouflage uniforms; three or four of them wore masks. Hani Hoxha climbed over two walls and found shelter under some wooden boards, where he stayed for seven or eight hours, until dawn. During that time he could hear gun shots and people’s voices. He heard someone say, “Spare me, don’t kill me” in Albanian. 6. In the basement of Lulzim Vejsa’ pool hall at about 0200 hours on 2 April 1999 Dren Caka was woken up by his mother. She told him there were police officers in the building. They heard a loud noise. Then the door of the room opened and six men dressed in the uniform of Serbian police entered the room. They told the occupants to get out. They said they were searching for KLA fighters. The men wore blue and blackish patterned police uniforms, i.e. in the Chamber’s finding the standard police camouflage uniforms, and were heavily armed with machine guns, AK-47s, and normal hand-guns. The policemen forced the group in a single-file line to go to the house of Lulzim Vejsa. The entrance door of the house was shut. One of Lulzim’s daughters went ahead to open the door but a police officer fired and shot the door down. Inside the house, most of the group sat down in the living room, but some three or four stayed in the hallway. Two policemen were in the living room. There was another policeman outside. There was only candle light. 7. While sitting in the living room, Flaka Hoxha went to make some tea but was pushed by one of the policemen. A policeman by the door fired at her. There were also some shots fired through the window. Flaka fell to the ground. She appeared to be dead. Her mother, Shahindere Hoxha, started screaming and ran out. She was also shot. Lulzim Vejsa’s baby daughter, Rita Vejsa, was then shot as she lay in the arms of Lulzim’s wife, Tringa Vejsa. She dropped the baby and was also shot. Dren Caka’s mother, Valbona Caka was then shot in the back and fell over Dren’s baby sister, Diona Caka. The policemen started to shoot everywhere. Dren Caka was shot in the arm. Then the police fired at a closet which started to burn and set the house on fire. One of his sisters gave Dren Caka a glove to press on his mouth in order to be able to breathe through the smoke. The policemen left. Dren Caka got up. Arlind Vejsa (five years old) was still breathing although he had been shot many times. Dren Caka tried to help him but as soon as he spoke a word the breathing stopped. Dren’s baby sister had not been shot but was lying under the dead body of their mother. He could hear the baby crying but could not do anything to help her as his right arm was shot and the body of his mother was too heavy. He left. As he was escaping from the house, he saw that the three police officers who had been inside the house were smoking outside. 8. The Chamber is convinced that the account of the events just described, as given by Dren Caka, who was 10 years old at the time of the events, was given honestly and reliably and accepts the veracity of the main facts he described. It rejects the Defence submission that due to his young age Caka would not be able to distinguish between forces, noting that he was able to identify the police uniform in his evidence from a booklet with photographs of various uniforms as well as the pattern of the uniform. Dren Caka also had personal acquaintance with a policeman living in his neighbourhood who wore the same blue camouflage uniform. Tringa Vejsa, Dorina Vejsa, Marigona Vejsa, Shihana Vejsa, Rita Vejsa, Arlind Vejsa, Fetije Vejsa, Hysen Gashi, Shahindere Hoxha, Flaka Hoxha, Valbona Caka, Dalina Caka, Delvina Caka, Diona Caka, Valbona Haxhiavdia, Doruntina Haxhiavdia, Egzon Haxhiavdia, Rina Haxhiavdia, Shirine Nuci, and Manushe Nuci. 10. The account of events given by Dren Caka is further confirmed by Sami Parashumti, who lived across the street at 82 Miloš Gilić/Millosh Giliq Street. Parashumti testified that in the early hours of 2 April, he heard gunshots coming from the direction of the Vejsa family home, across the street from where he was standing. When the shooting stopped, he heard children screaming from the yard of the Vejsa family home “[t]hey are going to kill us”. About 15 minutes later, when Sami Parashumti had returned to his house, he heard a second burst of fire coming from the Vejsa family home. From the roof of his house, Sami Parashumti observed a police van with its lights switched off; he saw approximately 12 men leave this van and enter his yard. Three of these men wore cowboy hats, green camouflage uniforms, and had painted faces. In the Chamber’s finding this description is consistent with the uniform worn by the PJP of the MUP. The remaining nine men were wearing blue camouflage uniforms. He observed seven or eight other policemen, also wearing blue police camouflage uniforms, climb over the wall to the Cana family home. Sami Parashumti saw approximately another 50 policemen along the street wearing the same dark blue police camouflage uniforms. 11. From the position on the roof of his house, Sami Parashumti observed a number of these men approach the Cana home, located next door at 80 Miloš Gilić/Millosh Giliq Street. Some entered the house and a few remained outside. At about 0145 hours, he heard Januz Cana’s wife Ganimete scream to him, “[o]ur son is gone”, and a few seconds later, he heard five distinct gun-shots. About five minutes after this, he saw four policemen come out of the Cana home with Januz’s daughter Shpresa, 43 years old, who was in pyjamas. One of the policemen ripped Shpresa’s top open and pulled her hair. The witness heard Shpresa yell at this policeman, “[y]ou killed my father”. The policemen then took Shpresa along the pathway towards the new house of the Cana family to a tunnel by the main road. One of these policemen had a knife. Shortly after they had gone inside the tunnel,he heard Shpresa scream. This was followed by a dreadful sound like an animal being slaughtered. Because of what he had seen and heard he imagined the worst for Shpresa Cana. These events related to the killings, in the Chamber’s finding, of four members of the Cana family. 12. Dr. William C. Rodriguez III of the U.S. Department of Defense, Armed Forces Institute of Pathology, examined bodily remains found at 80 Miloš Gilić/Millosh Giliq Street on 25 June 1999, and concluded that they represented four family members, whose bodies were dispersed throughout the house, consisting of an elderly male and female, and a male and female estimated to be in their late 30s to early 40s at death. The Chamber notes that this confirms the evidence given by Parashumti related to the killings of the four Cana family members. It is satisfied that Januz Cana, Ganimete Cana, Shpresa Cana, and Fatmir Cana were killed on 1 April 1999 by MUP forces because they were Kosovo Albanian. All these individuals were civilians taking no active part in hostilities. 13. While on the roof of his house from where he observed the events around him, Sami Parashumti realized that his own house was on fire. He jumped from the roof into his backyard and fled to the house of Afrim Berisha, about 35 metres behind his house and separated from his house by an empty space and a wall. Because there was a lot of smoke coming from his home, he and his family whom he had left there earlier had to leave Afrim Berisha’s house. They went to the house of Sadik Krasniqi, directly behind Afrim’s house. This house was unfinished, and there were many civilians hiding in it. 14. Many Albanian houses along the street were burnt that night. First, the house of Bardhyl Riza, which had been vacated, was set on fire. Then, the house of Fehmi Lleshi was burnt; Fehmi Lleshi and his wife Kimete Lleshi were taken away by the attackers and were never seen again. Their two children escaped through a hole in the wall. The house of Besim Bokshi was also burnt, as was the house of Esat Mullatahiri. The fifth house in this row of houses was not burned; it belonged to a Serb, Lubiša Raicević, a police reservist. The sixth house was connected to the Serb’s house, and although it was not burnt, the attackers killed the inhabitants, including Hysen Deda (75 years old), Caje Deda (65 years old), Afërdita Deda Demjaha (38 years old) and Argjend Ylber Demjaha (5 years old). Mentor Deda (35 years old) survived. The houses of Ali Lapi, Gezim Nagafci, Jonuz Cana, Njazi Parashuti, Rezak Parashuti, Xhevdet Muhaxhiri, Agron Nagafci, Ragip Ballata, Shkelzen Vogli and Lulzim Vejsa were all burnt. The house of K74 was burnt and every room of his house had been machine-gunned. 15. When Lulzim Veja and Behar Haxhiavdija walked back to the Vejsa family home on the morning of 2 April at about 0700, after having spent the night in an abandoned house, they saw that Albanian homes in the Ćerim/Qerim district had been burnt while Serb houses and Kosovo Albanian homes adjacent to Serb homes had been left untouched. The Vejsa family home had been burnt down and was being guarded by three policemen in blue reservist police uniforms. Lulzim Vejsa knew the three police reservists, who had all been mobilised in 1998-1999. Two of whom, Lubiša Raicević and Nenad Raicević, were brothers who lived 20 metres from his house, and the third, Novica Nedeljković, lived in another house also about 20 metres away. Lulzim Vejsa and his family had had good relations with the men and their families prior to the incident. As Lulzim Vejsa went past the reservist policemen, Lubiša Raicević said to him, “You see, Lulzim, what NATO did to us?” Lulzim Vejsa saw syringes and bottles in front of his pool hall. 16. At approximately 0730 hours, Hani Hoxha made his way back to Lulzim Vejsa’s compound. The compound had been burnt to the ground and there was smoke coming out of the basement where the women and children had been sheltering. Hani Hoxha did not see his wife and daughters again. He saw the burnt body of Lulzim Vejsa’s uncle, Hysen Gashi. Hani Hoxha went to a neighbour’s house where he met Dren Caka. Dren Caka told him that the attackers had said that they were going to execute all of them because they had asked for NATO and that the people in the basement were shot at a distance of 1 metre. 17. Lulzim Vejsa and Behar Haxhiavdija went to Lulzim’s paternal aunt’s house a further three houses away, and found his aunt, her husband and Hani Hoxha there. Lulzim’s cousin’s son Dren Caka was also there; his right arm had been injured. Lulzim’s aunt explained that all the people who had stayed in the basement were dead except for Dren. Hani Hoxha and Behar Haxhiavdija went to Lulzim Vejsa’s house and saw that it was completely burnt down and that the basement was still in flame and smoke. They could not find any dead bodies, only pieces of human flesh. Dren Caka was taken to the hospital by his aunt and grandfather. 18. It was the evidence of Frederick Abrahams, a researcher with Human Rights Watch that, shortly after the events described above, Faton Polloshka, a member of the Đakovica/Gjakova city public works, entered Lulzim Vejsa’s house and retrieved the 20 bodies, which had been burned beyond recognition. He told Abrahams that, in addition to those bodies at the Vejsa compound, he had retrieved 30 other bodies of people killed on 1 and 2 April 1999. Forensic evidence received by the Chamber and discussed in more detail later in this Judgement, confirms that some of the bodies from Lulzim Vejsa’s house were moved to the Đakovica/Gjakova public cemetery some time between 2 April 1999 and 25 May 1999. Dr. William C. Rodriguez III of the U.S. Department of Defence, Armed Forces Institute of Pathology examined remains found both at 157 Miloš Gilić/Millosh Giliq Street and at the Đakovica/Gjakova public cemetery. He concluded that an exact number of victims could not be ascertained due to the burnt and fragmented condition of the remains. Nonetheless, the remains of at least 20 individuals were represented including one adult male, several adult females and many children. 19. Evidence indicates that a number of Kosovo Albanian men were killed at the Đakovica/Gjakova bus station, located some 300 metres from Miloš Gilić/Millosh Giliq Street on or around 1 April 1999. Aleksandar Vasiljević, the then Assistant Head of the VJ Security Administration, received a report from Captain Sergei Perović that Đakovica/Gjakova SUP chief, Milovan Kovačević, had his own Operational Pursuit Group (OPG) called Legija which was involved in the killing of 20 male Kosovo Albanians in April 1999 whose corpses were found at the Đakovica/Gjakova bus station and left there for some days until some Roma people loaded these bodies onto vehicles, in Perović’s view, on the orders of the police. This evidence is partially corroborated by the examination made by Dr. Rodriguez of the U.S. Department of Defense, Armed Forces Institute of Pathology on 28 June 1999 of burnt and calcined skeletal remains found at the Đakovica/Gjakova bus station. The remains belonged to at least six adult males. On the remains of one body, there was clear evidence of a gunshot wound to the right scapula. The Report indicates that the men were killed on 1 April 1999. 20. As discussed earlier in this Judgement, on the basis of information from interviews of Kosovo Albanians conducted by the Council for the Defence of Human Rights and Freedoms (CDHRF), the CDHRF Chairman Fuad Haxhibeqiri concluded that Serbian forces killed about 60 Kosovo Albanians in Miloš Gilić/Millosh Giliq Street that night. This is consistent with the evidence heard by the Chamber as to the systematic and large-scale killings in Miloš Gilić/Millosh Giliq Street and the surrounding neighbourhood on 1-2 April 1999. 21. The Chamber notes the evidence of Defence witness Miloš Đošan, at the relevant time stationed at the VJ Vinarski Podrum facility in the Ljug Bunar neighbourhood, some 500 metres from the Ćerim/Qerim neighbourhood, who stated that he heard and saw nothing of an operation the night of 1 April 1999. He also testified that had killings taken place, he would have been informed of them, but that no such information was given to him. The Chamber seriously doubts the credibility and reliability of Đošan’s evidence. In previous proceedings, Đošan suggested that he had driven through the Ćerim/Qerim neighbourhood the night of 1 April 1999 after having assisted in pulling two wounded VJ soldiers from the P-15 radar installation which had been hit by NATO bombs earlier that evening, and had neither seen nor heard any signs of an operation. However, other evidence reveals that the P-15 radar installation was in fact hit the night of 31 March 1999; a fact confirmed by Đošan in his evidence in this trial. There is therefore no evidence that VJ units were present in the Ćerim/Qerim neighbourhood the night of the operation on 1 April 1999. Neither is the Chamber convinced by the assertion that the killings could not have taken place since Đošan was not informed about them. As discussed further below, the crimes were not reported by MUP forces as required by the law and there was a deliberate effort on the part of the MUP to avoid any proper investigation. It is therefore quite possible that Đošan may not have been informed about the killings. 22. The whole of the evidence above satisfies the Chamber that there was a planned deliberate offensive operation in the Ćerim/Qerim neighbourhood on 1-2 April 1999 by Serbian police, including members of the PJP and local and reserve police, in a systematic fashion, which involved the killing of unarmed Kosovo Albanian civilians, even women and children, and the destruction of the houses and property of Kosovo Albanian civilians. The operation was a direct response to the commencement of the NATO bombing campaign.